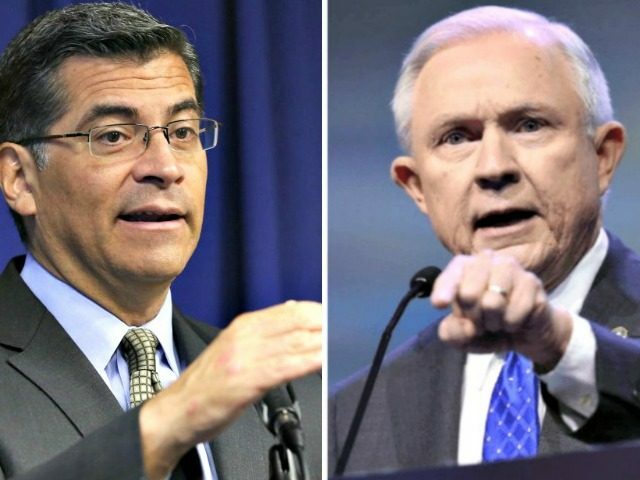 A senior DOJ official made clear that he believed the laws intentionally created obstacles for federal immigration enforcement in California, the state with most illegal aliens in the country. The defendants are the State of California, Gov. Jerry Brown, and California Attorney General Xavier Becerra – the elected official who, perhaps more than any other, has made protection of criminal illegal aliens and “resistance” to President Donald Trump’s immigration agenda his signature policy. The doctrine of “preemption” dictates that, as federal law reigns supreme over state law, states may not enforce laws that frustrate federal policies. It has a long history, dating back nearly to the dawn of the Republic with 1819’s McCulloch v. Maryland. In the immigration context, the doctrine was widely heralded by open borders advocates in 2012, when the Supreme Court relied on it to strike down sections of Arizona’s tough SB 1070 anti-illegal immigration bill in Arizona v. United States. The legal shoe is on the other foot now, as the Trump administration seeks to have California’s leading-edge sanctuary laws overturned on a similar theory. All three laws, passed in response to Trump’s victory in the 2016 presidential election, added new dimensions to California’s role as the nation’s leading “sanctuary” for illegal aliens. Not content with being merely a typical sanctuary jurisdiction, where, as a matter of policy, police do not contact U.S. Immigration and Customs Enforcement (ICE) agents about suspected illegal aliens, collect information on an arrestee’s immigration status, or comply with requests to hold suspected illegal aliens for ICE pickup, California enacted HB 450, SB 54, and HB 103. HB 450 came into effect at the beginning of the year. It prohibits private employers from cooperating with ICE. Under the law, if employers do not refuse to allow ICE officials onto their property without a warrant, they face stiff fines. If they try to check an employee’s immigration status a second time, they face fines. If they do not inform employees of ICE enforcement efforts about which they know, they face fines. During the first round of ICE raids after HB 450 went into effect, Becerra was very clear that his office “will prosecute” employers who cooperate. A senior DOJ official told reporters if the federal agency involved have been the FBI rather than ICE, a law like AB 450 would be inconceivable. He feared that, given its broadest reading, it might prohibit all private property owners from assisting federal immigration enforcement. SB 54, also coming into effect January 1, affects law enforcement officials, holding them statewide to the “sanctuary” standard previously in place in cities like San Francisco under penalty of state law. Under HB 54, California’s police officers and sheriffs cannot provide ICE with the release dates of the criminal illegal aliens whom they are holdings. Except for those held for a narrow set of serious crimes, these law enforcement officers cannot transfer detainees to federal custody voluntarily. Finally, AB 103 is a 2017 law Becerra has used to “inspect” facilities the Department of Homeland Security uses to house suspected illegal aliens who are awaiting removal proceedings. DOJ believes these inspections have demanded access to proprietary DHS documents and information. The government will first seek to have a preliminary injunction put in place to block enforcement of all three laws while their constitutionality is considered. DOJ will therefore have to show some irreparable harm that will come from allowing California to use these laws in the meantime. Senior DOJ officials were confident that, with a typical briefing schedule, they expect a ruling on their preliminary injunction within weeks.